Today in this post I will tell you a site where you can see moves sense into animated GIF images. You all see some animated GIF everyday but there is a site which took few seconds sense from classics movies and convert it to endless loop of animated GIF and post it on their blog called IF WE DON’T, REMEMBER ME. In this post I will tell you how you can watch trailers of upcoming movies and also which are already running in theaters. 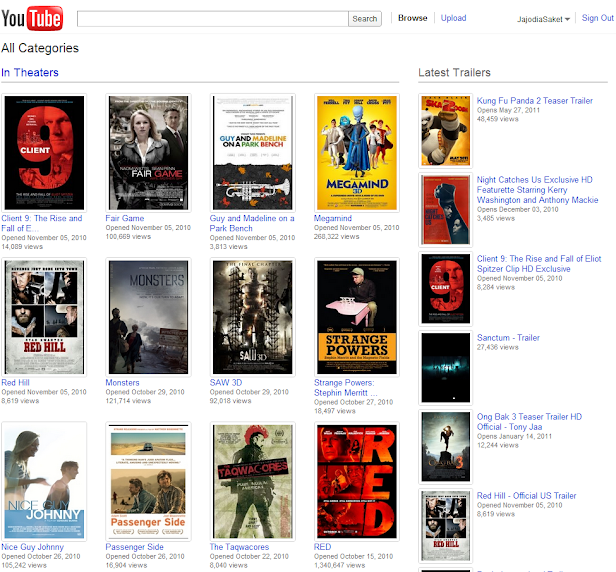 YouTube have a page where you can watch all the upcoming movies and also which are already running in theaters, by going to youtube.com/trailers. The best thing is you can watch it in the different categories (like: In Theaters, Opening Soon, Popular, Latest Trailers). Currently most of the trailers are from Hollywood, I could hardly able to see two movies from Bollywood. Let us know if you could you able to find the trailer you are looking for.